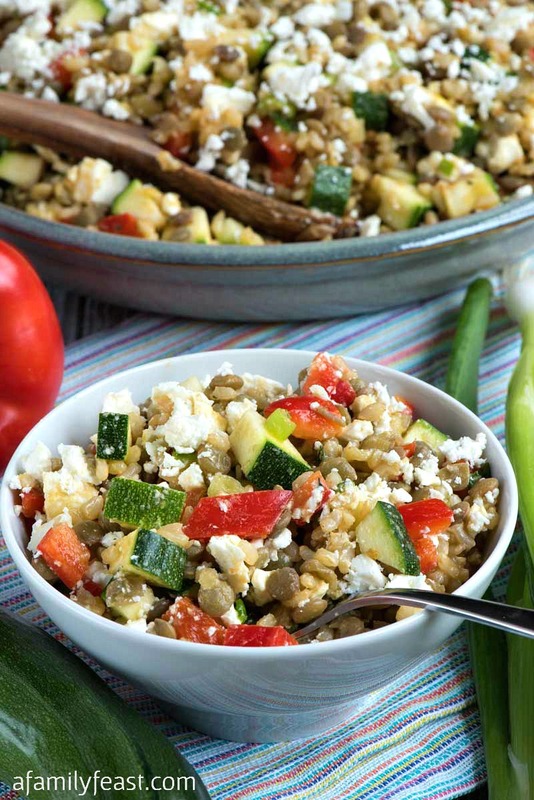 Lentils with Brown Rice and Feta is a delicious and healthy idea for a Meatless Monday meal. 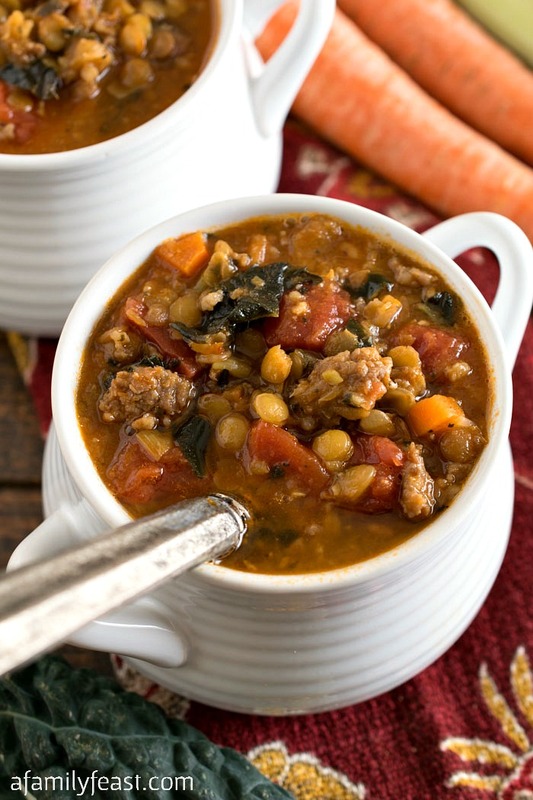 We originally posted this Lentils with Brown Rice and Feta recipe back in February 2013. 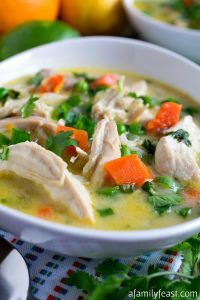 After making this delicious dish again this past week, I thought we were long overdue to update the photos in this post! 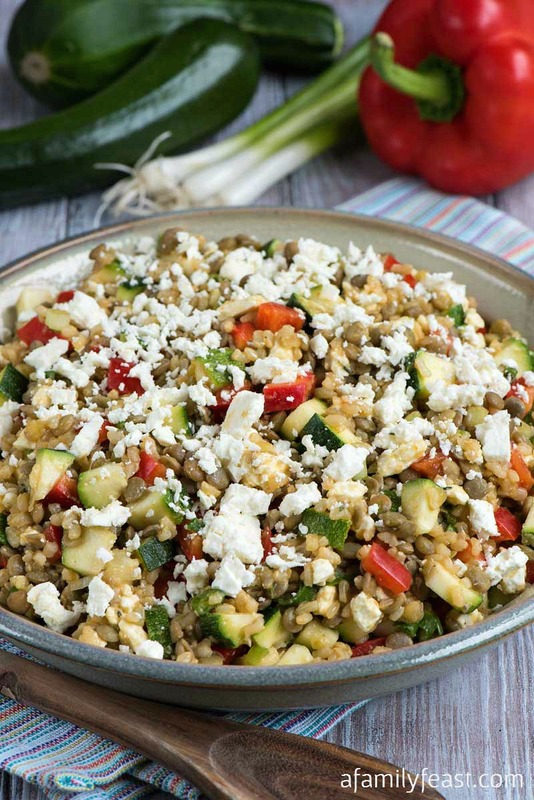 This hearty salad is made with brown lentils and brown rice (short or long grain is fine), plus diced zucchini, sweet red peppers, and scallions. 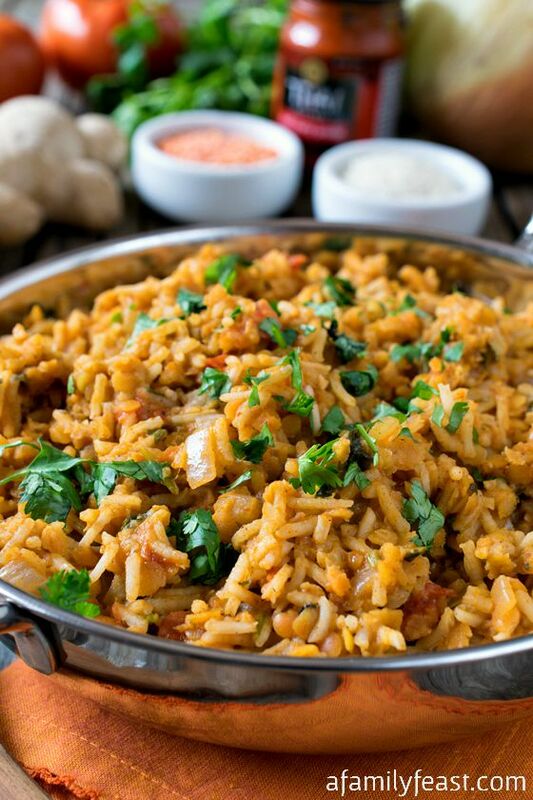 Crumbled feta cheese is stirred in while the rice and lentils are still warm, adding a touch of creaminess plus a burst of briny flavor that wonderfully complements the earthiness of the lentils and rice. Finally, the dish is finished with a simple dressing of extra virgin olive oil and red wine vinegar which also helps brighten the flavors. 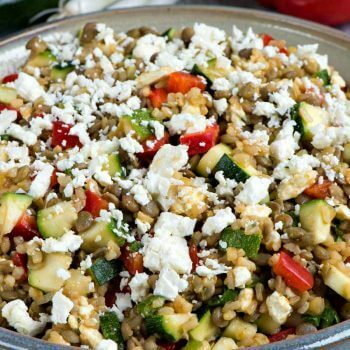 Our Lentils with Brown Rice and Feta can be served immediately while still warm, or at room temperature. It’s also delicious served chilled, and I love the flavor of the feta so much – I like to serve this with an extra crumble of feta on top. This recipe for Lentils with Brown Rice and Feta makes a generous amount, so you can also pack it up for lunch the next day. This recipe was originally clipped from the pages of The Boston Globe newspaper. 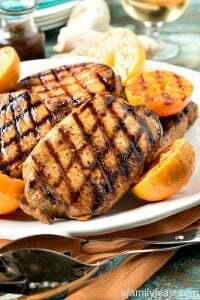 It was developed by Jean Kressy, who was the food editor for the Boston Globe, and also a contributing editor for Cooking Light magazine. In a large saucepan, combine brown rice and either stock or water. Cook rice according to package directions. While rice is cooking, prepare lentils as follows: In a medium saucepan, combine the lentils, bay leaf and 4 cups of water. Cover and bring to a boil. Reduce heat and gently boil uncovered for 15 minutes or until the lentils are tender but still have a bite. While rice and lentils are cooking, thinly slice the scallions, and cut the red peppers and zucchini into small ½ inch dice (remove any large seeds from the zucchini if necessary). Drain the lentils and discard the bay leaf. Transfer to a large bowl. Add the cooked rice, scallions, red pepper, zucchini, feta, oil, vinegar, thyme, salt and pepper and combine with a large spoon. 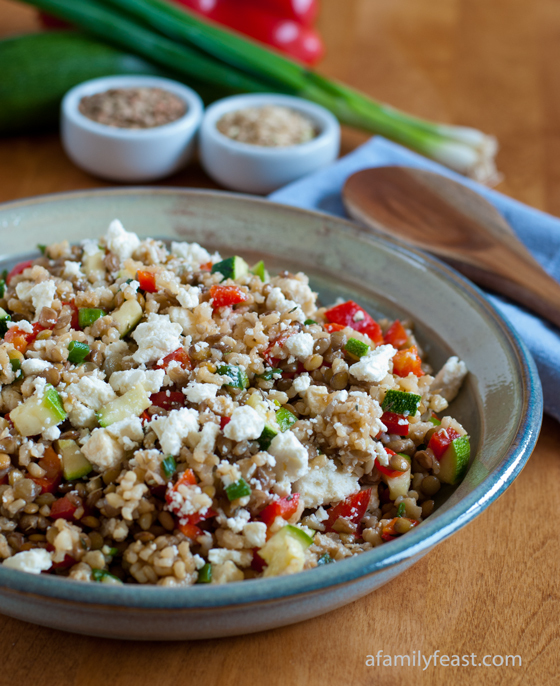 Serve warm or at room temperature with additional feta cheese crumbled over the top. Very healthy and tasty recipe! I had leftover white rice and was looking for something to make with it. This recipe was perfect and delicious. I had leftover rice and lentils still so I decided to combine to the leftover salad. I then added cherry tomatoes and cucumber instead of more peppers and zucchini. Added all the other remaining ingredients listed (except pepper and zucchini of course). This was also a great combo for the salad. Will definitely make this recipe again! This was so delicious! Great stand alone meal, very filling. Adding to our menu. Thank you! You’re very welcome Ursula! So glad you enjoyed the recipe! Yum! 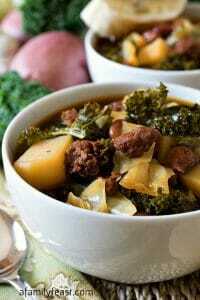 This looks like a fabulous meal (I always feel at quite a loss for good, meatless meals). One thing (that perhaps would answer itself after I made this? ), but I’m wondering how one would do leftovers of this? Is it a cold salad? Fresh, the rice and lentils would be warm from cooking, but veggies are raw/uncooked, right? So leftovers would be eaten straight out of fridge? 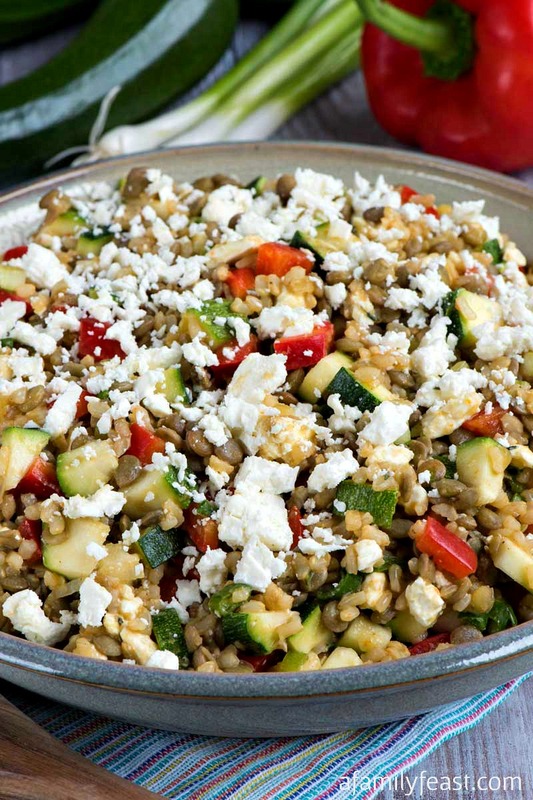 Brown rice, lentils & feta!? I’m so excited to try this. Amazing! 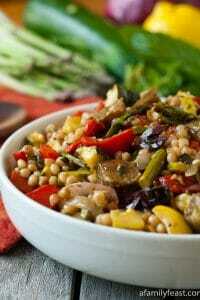 I’m not even much of a lentil person but I would gladly devour this any day of the week! Love that it’s vegetarian-friendly too. Thanks for stopping by! I hope you try (and enjoy) the recipe! Does anyone have an idea what the calorie/nutritional facts on this meal would be? Hi Kaitlin – I haven’t calculated the calorie or nutritional info myself, but perhaps you can find an online tool to do the calculations? Sorry I don’t have more info to share. Looks and sounds like it would be delicious! Perfect for make ahead lunches.